Website usability testing is simply to observe how users complete specific tasks on your website, helping ensure your new website meets their needs. You want to sell more products, generate more downloads and registrations on your website? No problem. You basically have two options; On the one hand, you can bring in more relevant website visitors. However, that is usually associated with higher marketing costs or a great deal of time. Or, you can take full advantage of the existing visitors and increase their conversion rate. The advantage of this method is that a one-time cost can give you permanent positive effects. Website user testing help you to check the usability of your website and to avoid the mistakes that are killing your conversions. 1. How does an unmoderated usability test take place? In an unmoderated website usability test, you ask participants to solve previously defined tasks on your website. Since an quantitative or analytics only based observation gives no information about the thoughts and feelings of the tester, the participants of the UX test are encouraged to follow a “think aloud” protocol, speaking their thoughts and feelings outloud as they encounter challenges and frustrations. Only in this way can you discover the “why”, and not just the “what” or “where” during the usability evaluation. A website user experience test should consist of a scenario and several tasks and questions. In the scenario, you should describe the general “mind set” participants should imagine themselves being in. The tasks and questions can then precisely specify what the tester should do, attempt to do, and/or answer. Example: Let’s assume that you have an online store for runners. A suitable scenario could look like this: imagine you are a passionate amateur runner and run about 30 minutes, 3 times a week; you run mainly on the streets and have frequent knee problems; hence you place a great emphasis on good cushioning. Therefore, the first user testing task could be: find a suitable running shoe in our online shop. A detailed user scenario description makes it easier for a tester to regard himself as a real visitor, and thus make as natural responses as possible. During the UX test, ideally, the screen, the voice, and the webcam view of the tester are recorded, in a picture-in-picture format, for a subsequent usability analysis and evaluation. Usability design matters to UI/UX designers, and the user-friendliness of your website is crucial to your success. You should therefore identify and eliminate any problems that visitors may encounter when using your site. Small things often make the difference. It can be the bad labeling of a navigation point or a button that is not in the right place. Even if you spend a lot of time on your website every day, you may not notice these things, because you are very familiar with the UI, and with the way you know the site wors, and the manner in which you expect users to interact (which may be quite different than how they perceive and interact with the site!. A user experience research program based on an advanced user testing platform can show you which website elements you should rethink or change. No one knows your website and your products better than your employees and yourself do. It may be clear for you that the login button can be found in the footer and the search function hides behind the magnifying glass symbol. However, you will not notice most of the potential problems nd challenges that urk behind a non user tested UI. Therefore, it is important to conduct website usability tests with people who are not yet familiar with your website and your company. Employees, friends and acquaintances should also be excluded because they already have too much knowledge about your company, your products and your website. You should always carry out tests with external and neutral persons. Visitors always visit your website with a certain expectation. Each scroll movement and click is performed for a specific reason and an associated expectation. Through user tests, you will know their expectations and can see if your site matches them or not. There are many different types of user experience tests. Deciding which method is best for you depends on your knowledge, your resources and your budget. For tests in a usability lab, you usually commission an external agency to carry out the tests. The agency supports you with expertise, facilities and UX analysis and reports. One of the disadvantages are its high costs (usually over 10,000 € depending on the sample size) and uncertain laboratory effects, as the tests take place in an unfamiliar (to the participant) environment. If you already have certain experience conducting website usability tests, you can also carry out the test yourself. The usability testing process has 7 steps: pre-test preparation, test prototypes, writing test scripts, recruiting testers, setting up the test environments, testing the usability of your prototypes and statistical analysis of the test results. You can use Mockplus to test your prototype in 8 different ways in terms of prototype preview and presentation. Online usability tests are a new kind of website usability testing, where the client only needs to determine the scenarios and tasks and select the target group, which are completely finished online, with participants interacting with your prototypes in a natural environment, their homes or offices. The providers of online usability tests usually have a panel of participants. The most advanced user testing platforms include picture-in-picture recording of participants from their home (webcam view, screen recording and audio). One of the leaders, Userlytics, includes the possibility to add standard usability metrics like System Usability Scale (SUS), Single Ease Question (SEQ), as well as Net Promoter Score (NPS), Time on Task and Success/Failure metrics. Userlytics also includes the possibility to use conditional logic (“Branching Logic”) in the design of the user testing script, such that, depending upon the answers to a question, participants are redirected to different task and/or questions. In this way, the advantages of unmoderated testing (scalability, inexpensiveness, natural settings of participants, geographically dispersed participants), are coupled with the advantages of moderated testing (personalized instructions and questions for each participant). 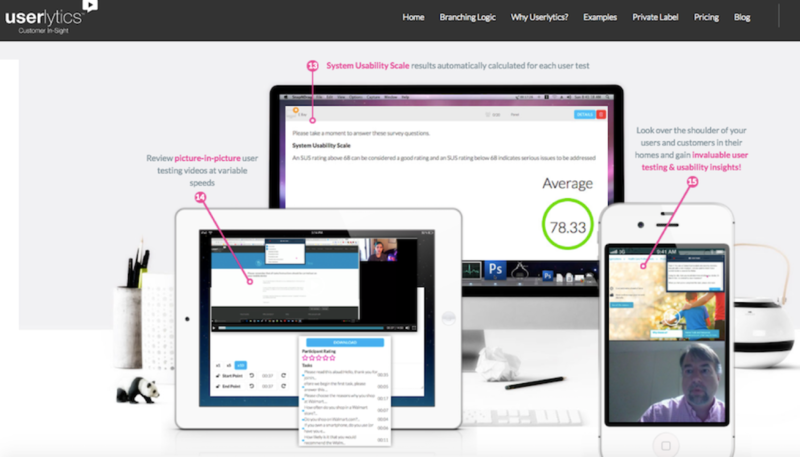 - Time on task user testing metrics automatically collected, totally hassle-free. - Picture-in-picture user testing videos, no SDK, no rooting, no special hardware integration required. - Branching logic for personalizing the UX test script. - Shareable user testing project dashboard on the cloud that can also be private labelled with your own logo and colour scheme. Click here to learn more cool features about Userlytics, you can even set up an account for free and play around with it before making a purchase decision. To summarize. Usability and user experience testing is different from User Acceptance Testing, in that the purpose is not to find bugs, but to uncover insights as to why participants do the things that we see them do in our analytics platforms, and resolve the barriers to usability and user friendliness that always exist in our initial designs.